The subject of the End Times can be very daunting. Various places in the New Testament address the topic, but by far the most fascinating discussion in the Holy Scriptures that digs into End Times issues can be found in the very last book of the Bible: The Revelation. As I was nearly completing this blog post on the Book of Revelation, I read about a new Christian movie coming out this year, Left Behind. What? Nicholas Cage in a Christian movie? Yep. That’s right. What a great lead in on a blog post about the Book of Revelation! How did this all come about? Well, the story is that some years ago, best selling Christian authors Tim LaHaye and Jerry B. Jenkins wrote a series of popular books of the same name. The only book series that has topped Left Behind in sales in recent years is Harry Potter. In 2000, Cloud Ten Pictures released a theatrical version of the book, starring Christian actor Kirk Cameron. Left Behind: The Movie was a total bust at the box office. Unlike the Harry Potter films, Left Behind: The Movie never went very far. Well, here is the trailer. Does this look like your idea of a Christian film? I am still working on the concept of Nicholas Cage being in this film…. Anyway… Undoubtedly, the film will be controversial, particularly among Christians. Fans of the book series might flock to the theatre, just to see if the “Rapture Reboot” with Nicholas Cage was really that much of an improvement over Kirk Cameron. Nevertheless, the film does raise a lot of questions about the Bible, the type of issues you simply will not be able to resolve just by going to a movie theater, or viewing later on Netflix. 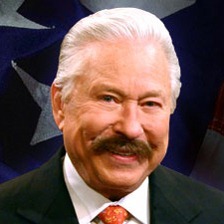 Before there was Nicholas Cage in the Left Behind movie, and Kirk Cameron before that, there was Hal Lindsey, the great 1970s and 1980s popularizer of EndTimes scenarios based on a dispensationlist interpretation of the Book of Revelation. The last book of the Bible is a very curious book, by nearly anyone’s observation. Both believer and non-believer alike are fascinated by the vivid imagery and the talk about the “End of the World” in the Book of Revelation. It is perhaps the one book of the Bible where everyone has an opinion on it and yet very few have any clue as to what it all means. In the early 1980s as a fairly new believer in Christ, I really did not know what to do with the Book of Revelation. I would start to read it, but I soon found myself overwhelmed with blaring trumpets, multi-headed beasts, and a lake of fire. How was I to make sense of such a book? Author Hal Lindsey had ten years previous written a blockbuster book, The Late Great Planet Earth. Lindsey’s 1970 bestseller was the most popular religious book of that time, aside from the Bible itself. The New York Times called it the number one non-fiction bestseller of that decade. Lindsey and his followers looked to the modern creation of the Israeli nation-state in 1948 as signaling the coming of “the Rapture,” and other great momentous events prophesied mainly in the Book of Revelation, regarding the second coming of Jesus, all to be fulfilled possibly during the following decade of the 1980s. One of the key details in Lindsey’s scheme was the identity of the beast with ten horns in Revelation 13:1-10. Lindsey saw that this creature represented the development of a ten member European Common Market, what we now call the European Union. In those years, there were nine members of the European Common Market, so we were only one nation away before the prophetic clock suspended in Daniel 9 was restarted, unleashing the catastrophic events of the End Times! This whole intricate decoding of the Bible was pretty cool, and so immediately relevant to current events, or so I thought. Church after church over the subsequent years would sponsor “Revelation” seminars, all designed to attract new members and uncover the mystery held within the book. Since the events in the Bible were coming just around the corner, people needed to be prepared!! Well, what has happened since then? Not long after I began to dig into the Book of Revelation, Greece joined the European Common Market in 1981…. followed by Portugal in 1986… then Spain a few months later. Now we have 28 nations in the European Union. It is now 2014. So what happened to that whole Rapture thing? It should be evident that Lindsey’s particular scheme has long since fallen apart, but this does not dissuade diehard followers on late-night cable TV channels. Lindsey’s most ardent supporters do not seem deterred by some of the personal challenges he has faced over the years, most tragically a succession of three marriages all ending in divorce, and in a fourth marriage now. Apparently, the desire to try to figure out all of the details of the End Times for some people is pretty hard to resist. Were Lindsey and friends simply mistaken in their interpretation of the future events described in the Book of Revelation? Is the solution simply to re-tweak some of the timeline for the events of the End Times? Will a revived interest in the End Times spawned by movies like Left Behind encourage people to take another look at the Bible? Or would it be more responsible to take a different, cautious approach, and avoid the temptation to assign current and future events to particular details in the Bible altogether? Or, could it be, that the problem in interpreting Revelation is more profound? Was Lindsey’s and others’ whole paradigm for how to interpret the book in general fatally flawed? Would the first generation of readers in the first century have made sense of these popular, contemporary approaches to the book? What is the Book of Revelation all about, anyway? As it turns out, when someone begins to take seriously the study of the Book of Revelation, there is a much broader scope to this intriguing book of the Bible, compared to the Hal Lindsey-type approach I was fed as a younger Christian. The popular mindset of digging through the text for clues for the “End of the World” timeline is in many ways a distraction from the original purpose for which it was written. (Do me a favor: The next time you hear someone talking about “Revelations,” in the plural, please gently tell them that it is “Revelation,” in the singular. That will make me feel better. Thanks)….Moving on!!….. The Book of Revelation is essentially a description of the contents of a vision given to the author, most commonly thought of as the Apostle John, traditionally known as the last living, original apostle and disciple of Jesus Christ within the first generation of the Christian movement. The book was written to an audience of persecuted believers. The original readers of the Revelation took great comfort in what John’s mysterious vision sought to unfold before them. We can take great comfort in John’s message even today, particularly when we face great trials and obstacles for the sake of upholding the Christian faith. So, what is this book uncovering or revealing? Well, the history of the church shows that many Christians have been perplexed by this book, so I am glad to know that I have not been alone! Going back in the early church, the Book of Revelation was the last book to be admitted into the New Testament canon, partly due to the mysterious meaning expounded within the text. During the Reformation, Martin Luther was originally reticent to translate the book into German, thinking that it really should not be considered part of the Bible. The great Geneva Reformer, John Calvin, wrote a commentary on every book of the Bible… except Revelation. Even some of the greatest minds in the church have been challenged by the mystery of this phenomenal book! How Do Different Christian Believers Approach Revelation? There are several schools of thought on how to interpret the Book of Revelation, particularly chapters 4-22. Broadly speaking, some Christians emphasize that the book is primarily interested in addressing events in the future; that is, the futurist type of approaches, while other Christians emphasize that Revelation primarily looks at events that have happened in the past, such as the preterist view, with only a small portion of the book addressing future type events. The most common approach among evangelical Christians is that of the futurists, including that of Hal Lindsey. In the United States alone, it is difficult to throw a rock anywhere without hitting a futurist. The futurist essentially looks at these chapters as depicting events that will happen sometime within the future, leading up to and including the Second Coming of Jesus Christ. However, to be fair, the extreme date-setting mentality of the Hal Lindsey-types does not really represent the whole spectrum of futurist approaches to the Book of Revelation. There are basically two types of futurists. The classic futurist sees the events referenced in Revelation as describing the full end of history, signs that will unfold before us. The climatic event in this approach is the establishment of a one-thousand year reign of Jesus Christ, where the second coming of Jesus happens prior to the start of this earthly reign (historic premillenialism). But this classic futurist approach differs greatly from the more modern Hal Lindsey-method of reading Revelation. Since about the 1830s, a newer variation of the futurist approach, dispensationalism, looks to the Book of Revelation as revealing what will happen in the period when God restarts the prophetic time clock for national Israel, that was suspended back during the days of Jesus Christ in the first century A.D. The time clock for national Israel will eventually get restarted, finishing out with a one thousand year reign of Jesus Christ as the Messiah. This dispensationalist approach was the theological basis for much of the Hal Lindsey-framework I was taught back in the 1980s. Before there was Hal Lindsey, there was John Nelson Darby (1800-1882), the British Bible teacher who popularized the contemporary doctrine of the Rapture and the Dispensationalist school of biblical interpretation. Then we who are alive, who are left, will be caught up together with them in the clouds to meet the Lord in the air, and so we will always be with the Lord (ESV). Darby was concerned that it was extremely difficult to take a futurist approach to the Book of Revelation and make it all fit with this view of the Second Coming. Darby’s remarkable insight was that he was able to appreciate and subsequently popularize an interpretation of the Bible that was relatively unknown at the time. Darby came to believe the Second Coming is essentially a two-part event. The second part will be the actual coming of Christ. But the first part will be the gathering of the saints of I Thessalonians, commonly known as the Rapture. In between the first and second parts, between the Rapture and the final stage of the Second Coming, a period known as the Great Tribulation, a seven-year period, that dispensationalists suggest forms much of the narrative in the Book of Revelation (note that “the Rapture” is never specifically mentioned at all in the Book of Revelation. The main text for the doctrine is the 1 Thessalonians passage above, though a number of scholars infer the doctrine indirectly from elsewhere). This splitting of the Second Coming into two separate parts is primarily what distinguishes the classic futurist approach (historic premillenialism), which emphasizes the Christ’s coming and the gathering of the saints as being a singular event, from the more modern dispensationalist approach. Both the classic futurist and dispensationalist approaches emphasize that the ultimate triumph of Jesus Christ over the powers of evil remain a future hope. However, critics say that these futurist positions, by emphasizing the futuristic aspect of the text so much, tend to downplay any effective meaning for the original readers of this biblical text in the first century. The preterist school takes the opposite approach that the futurists take, emphasizing that the bulk of the events described in Revelation have already happened, mostly in the first century AD. Preterist is derived from the Latin word for “past.” There are basically two forms of preterism: the hyper-preterist (or full preterism) and the partial preterist. The hyper-preterist is an extreme approach that views that all of the events of the Book of Revelation, including the Second Coming of Jesus Christ, as having already been fulfilled in the past. Hyper-preterism is generally considered to be an unorthodox, heretical view. In contrast, a partial preterist takes an approach that is consistent with an orthodox view of Christian faith. The partial preterist still believes that most of the events of Revelation were fulfilled during the destruction of Jerusalem and its Temple in 70 A.D. A partial preterist, however, believes that the Second Coming of Jesus Christ is still a future event, as described in chapters 21-22. Preterists believe that Revelation was written primarily to encourage believers in the first century, who were suffering for their faith, and showing how God vindicated them in their suffering through the direct fulfillment of prophecy. However, critics of preterism observe that this interpretation relies heavily on an early dating for the writing of the Book of Revelation. Preterists believe that the book had to have been written prior to the events of 70 AD, for them to be considered prophetic, whereas the bulk of New Testament scholars believe that the book was written fairly late in the first century. The historicist school looks to Revelation as symbolically describing specific events of world history, beginning in the first century up through today, as well as anticipating the future coming of Jesus Christ. For example, some historicists see the Roman Catholic church as a fulfillment of the harlot of Babylon in Revelation 17. Needless to say, theologians coming from a Roman Catholic perspective brush off that particular interpretation. Some Roman Catholic interpreters instead suggest that the harlot could be associated with the rise of Islam. The historicist position tries to take the best elements of both the preterist and futurist approaches, but critics say that the historicists have a difficult time mapping the events of world history to the symbols of the text, thus tending to over-spiritualize the book. The idealist school looks to Revelation not in terms of revealing specific events in world history, past, present or future. However, the idealist looks to Revelation as showing a type of pattern of how Christians have suffered, are suffering now, and will continue to suffer in the future for the sake of the Gospel. An idealist views the harlot of Babylon as representing any political or religious system that seeks to oppress the church, as opposed to some strict association with an historical event. Idealists greatly emphasize the spiritual meaning of Revelation, much to the chagrin of critics who look for more literal ways of reading the text. How To Make Sense Out of All of This: What To Do with Revelation? As you can imagine, trying to figure out what is getting uncovered in the Book of Revelation can get rather involved. Some even try to find ways of combining a number of the different schools to come up with a hybrid model for interpreting the book. No matter how one ends up approaching the book, it still requires the student of the Bible to make a responsible effort to best understand this most unusual of books in a way that does justice to the text itself. Having a good study Bible will help to sort out some of the issues of the different schools of thought. I like using the English Standard Version Study Bible, but there are plenty of other good resources out there. The main thing is that it would be helpful for Christians to make some reasonable attempt to understand the different positions mentioned here, even if you remain convinced that the position that you are most familiar with is indeed the best one. Many times believers will only be familiar with the one particular approach, that they have heard taught to them for many years, and they never take the time to try to grasp the arguments made by differing perspectives. I see two primary benefits for reading and studying the Book of Revelation, and they really have relatively little to do with the latest fads in trying to figure out the “End Times.” First, Revelation helps us to understand what it is like to live under the threat of persecution. No matter what position we take on reading the book, it is very important to understand that the original readers of the book in the first century were going through very difficult times. In places where there is not much active persecution, the Book of Revelation can sometimes come across as very peculiar. But when you think about believers even today who live in places where their faith is under attack, Revelation can provide a special comfort to them. Secondly, the Book of Revelation is filled with allusions to the Old Testament. In a way, the Book of Revelation is like the “Bible in review.” Perhaps the best way to read the book is to take your study bible and go back and read the Old Testament references that are associated with what you are reading. You will find such a richness there that it will encourage you to go back and gain a better grasp of the breadth and depth of the Old Testament. The most effective way to gain perspective on the future is to study the past. Uncovering the message of the last book of the Bible helps us to do just that. Hopefully, in some future Veracity postings, we will look at unpacking some of the dense details I have merely introduced in this blog post. Am I suggesting that there will not be a catastrophic event where millions of people disappear all of a sudden, cars crashing on the freeway, and large planes losing their pilots? No, not necessarily. But I am no longer convinced that the dispensationalist concept of the Rapture holds the definite answer on how to interpret the Book of Revelation. There are pros and cons to each perspective. However we are to understand the End Times, and in particular how we are to best and properly interpret the Book of Revelation, might require some humility in how we approach the text. We can all rest assured as followers of Jesus that He will indeed return in Glory and Judgement, though we may as Christians differ on the particulars, agreeing to disagree on exactly all of the details involved. We do not need to be anxious about the future. Instead, we can have the confidence that Jesus Christ will truly come again and make things aright, a confidence that the non-believer simply does not have. So if you go see a movie like Left Behind, just bear in mind that you are not being exposed to the Christian view of the EndTimes, or the one and only view of the Book of Revelation. Perhaps things like the Left Behind movie might get people to reconsider the current trajectory of their lives, and then encourage them to dig into some of the more straight-forward teachings of the Bible. You never know. But it would be important to remember that with films and books series like Left Behind, you are only being exposed to one particular view among a number of others that have been held down throughout the ages in the Christian church. The way to figure out which view is the correct one, if we can be so bold as to know even that much, will not be discovered by going to a single Hollywood movie. Instead, such knowledge and understanding will only be grasped by a serious and balanced study of the Bible itself. See this previous Veracity posting on some of the basics of dispensationalism and alternative points of view. This entry was posted on Tuesday, October 7th, 2014 at 11:59 pm	and tagged with book of revelation, eschatology, hal lindsey, john nelson darby, left behind, rapture, second coming and posted in Topics. You can follow any responses to this entry through the RSS 2.0 feed. Thanks for the comment, and thank you your daughter and SIL for the brief film review. Great summary of a difficult subject. Good article and interesting links. I will have to check them out more in detail. God bless. Thanks, Chris, for stopping by Veracity. We would love to get your feedback on your subsequent research. The Book of Revelation is always a vital, and yet often confusing, topic for believers.